Holiday tipping: Who's expecting a holiday tip this year? 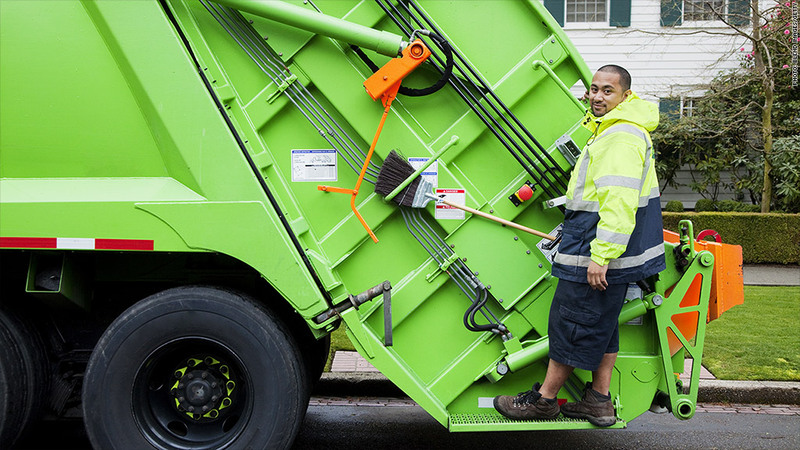 Did you remember to add your garbage collector to the holiday gifting budget? What about your Zumba instructor? 'Tis the season for gifting (and tipping), and there's a whole list of people who may be expecting a few dollars. Early December is prime tipping time, and this year Americans are expected to give more holiday tips than last year. The surge is good news for house cleaners, hair stylists and elevator operators, but for the tipper, parting with those extra dollars can be as painful as it is charitable, according to a recent report by Care.com (CRCM), a site connecting consumers and caregivers. Take delivery people. According to the study, 1 in 3 people wish they didn't have to tip them a little extra this holiday season. A similar sentiment goes for child care providers -- 14% of respondents wish they didn't have to include them either. But they do. For nannies, the recommended holiday tip is one to two week's pay. 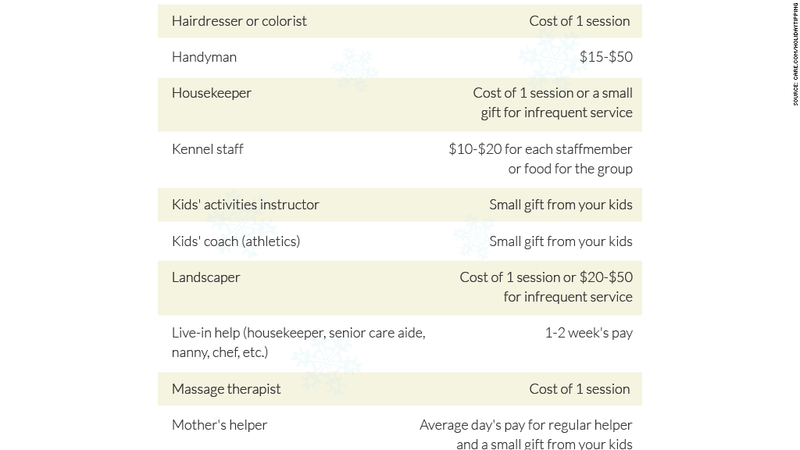 For day care workers, it's $25-$50, plus a small gift from your child. Also on the list are building superintendents, baristas, dog walkers, dry cleaning delivery people, personal trainers and school bus drivers. The survey showed that 17% of people tip because of expectation, compared to 73% who do it to say thank you. About 6% tip out of fear they won't get good service next year if they're stingy. Fear should never be a factor in gifting, said Diane Gottsman, an etiquette expert. "You should not feel blackmailed that they're not going to give quality service," she said. "A gift is not an obligation." Still, deciding who receives that gift can become contentious. About 15% of people said they argue with their partner about tipping, which is no surprise, given that 1 in 4 people plan to spend more than $250 in total -- a large chunk of some household budgets. Sticking to a holiday tipping budget, and allocating cash or gifts starting with those closest to you, is the best way to handle a longer list, said Katie Bugbee of Care.com. For those who skip the tip, there may be some savings, but it comes with a healthy side of guilt -- especially if you're a woman. Over half of the women surveyed reported feeling guilty about not tipping, compared to 39% of men. "Women are just feeling guilty all the time," Bugbee said. "Even when they are handing out a lot of cash, they can't win." Gottsman advised that when wondering where to draw the line, it's simple: If you wouldn't gift that person, don't tip them. Lists that offer guidelines for tipping should be regarded as suggestions and not rules. Some may not tip because they just don't have the money, which is true of 28% of respondents. Still, Bugbee said to be mindful of the message that could send. Even if a cash tip isn't possible, send on a hand-written note or a homemade food item -- especially if it's people who work in your home. "If you're having a very economical Christmas they'll know that and they'll see that," she said. Gottsman agreed, saying that while gifting is a choice, not giving anything may leave an impression that says, "I'm not as appreciative of you." But it is the holiday season, after all. "You give with good cheer, you give with good will," she said. Wondering how much to tip everyone, from the animal trainer to the Zumba instructor? Check out this handy list, courtesy of Care.com.